The Software Academy is a three-month paid training programme designed to train software developers in object oriented programming using C#. At the end of the three-month training, the top five software developers who meet our skill set requirement will be given a full-time employment opportunity with the company. 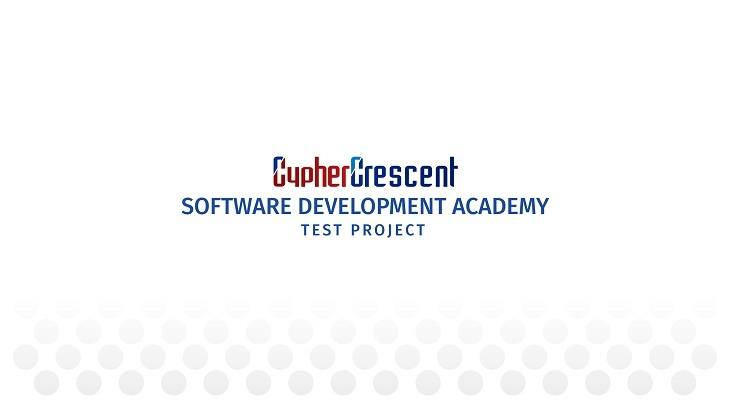 Interested candidates are required to programme the provided test project following the instructions therein and email their submission and presentation slides to s.academy@cyphercrescent.com not later than December 31, 2018. A PDF document containing the test project with detailed descriptions of tasks is made available for download here. Kindly download and programme accordingly. Candidates with satisfactory project reports will be contacted to schedule a physical presentation of their solutions. The best ten candidates will be selected for the Software Academy. The ten selected candidates will be paid during the three month training period. At the conclusion of the training period, participants will be evaluated and the best five performers will be offered a full-time employment with the company. For more information or clarification, please contact careers@cyphercrescent.com. To avoid disqualification, PLEASE DO NOT MAKE TEST PROJECT SUBMISSIONS TO THE CAREERS EMAIL.